1. Marinate beef pieces with remaining ingredients numbered 1 for at least 30 minutes. Pressure cook for 4 – 5 whistles until done. 2. Heat 2 – 3 tbsp coconut oil in a deep heavy-bottomed pan over medium high heat. Next add thinly sliced onion and little salt. Saute until onion turns transparent. Add ginger, garlic and curry leaves. Saute until until onion turns light golden. Bring down the heat to low. Add turmeric powder,chilly powder and coriander powder. Stir for a minute until their raw smell disappears Add chopped tomato and salt, to taste. Saute until tomato gets mashed up and oil separates. Add 1 – 2 tbsp water, if required. Add 3/4 tsp garam masala powder. Mix well. Add cooked beef pieces along with the gravy and mix well. Bring it to a boil. Add 1/4 cup coconut milk and mix well. Cook covered for 8 – 10 minutes over medium-low heat, stirring in between, until the beef pieces are well-coated with the masala. Add a pinch of garam masala powder and a pinch of pepper powder. Mix well and switch off. 3. Clean a large banana/plantain leaf (if the banana leaf is small, you may need 2) and wipe well. Place over flame to make it soft and pliable (vazhayila vaattuka). 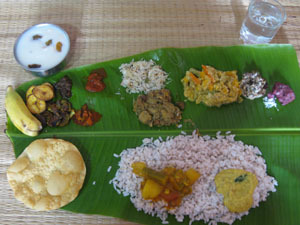 Place the cooked beef in the middle of the banana leaf. Wrap it carefully and tie using a twine or banana string tightly. You can also tie it in the form of a kizhi. Steam cook for 5 – 6 minutes OR Heat 2 tsp coconut oil in a small pan. Cook the beef parcel for 2 – 3 minutes on each side over medium heat. Serve after 10 minutes with porotta or rice.